Runners, swimmers, skiers and many other sports-people can decide whether they want to specialise in marathons or sprints. We musicians don’t have that choice: we need to be able to do the musical equivalent of both. Playing lyrical slow melodies beautifully is a huge and essential part of a cellist’s required skills but we also need to be able to do the high-speed sprint pyrotechnics – which usually come immediately after (or just before) the lovely slow stuff! The cello is quite a large, cumbersome instrument and is not ideally suited to high-speed virtuosity. The distances between the notes are larger, and the instrument speaks slower, than the violin, saxophone, clarinet and many other more virtuosic (fast-response) instruments. Taking an analogy from the world of motor vehicles, the cello would be somewhere between a truck (doublebass) and a Ferrari (violin). In the animal world, it would be somewhere between an elephant and a hummingbird: a large sheep perhaps??!! “Fast” is a very interesting and wide concept. When looking at the problems posed by a “fast passage” we need to differentiate between the different types of problems that fast playing can pose. Some fast passages are very short, with only a few fast movements following on from each other rapidly in succession. Rather than “fast” passages we probably think of these as “tricky” passages. Here the main problem is the rapid coordination of just a few different movements. At the other extreme we can have very long fast passages, in which problems of endurance, reading, memory and inner visualisation are added to the speed/coordination requirements. Almost every longer piece of music has its “fast passages” so there is a vast abundance of practice material to choose from. Click here for a selection of repertoire excerpts, grouped according to the type of difficulties involved. Below, we will look in detail at some of the different concepts involved in “fast” playing but for more detailed practical tips and tricks concerning how to play and practice fast passages click here. What then is “fast” playing”? Is it always difficult ? What makes it difficult? In outer space, astronauts are flying around at tens of thousands of kilometers per hour, but because there is no air friction (wind) up there, it feels to them as though they are not moving at all. The same phenomenon occurs when we travel by plane: we feel no rushing wind, we are making no effort, the plane is not vibrating and shaking like crazy (hopefully), the earth underneath us is moving very slowly ……. the whole experience is so smooth and easy that we don’t feel that we are moving fast at all. So the concept of fast has two completely separate components: the objective and the subjective. The objective speed can be measured: in the case of music we could use “notes per second”. The subjective sensation of speed however could only be measured by physiological measurements that evaluate our emotional state, because the feeling of speed, is usually just the feeling of difficulty, stress, sensory overload, loss of control. When we play something fast but effortlessly, it no longer feels fast. For example, play a tremolo …….. now a slurred trill. Easy, no? If we do this with a metronome, we can actually measure our speed. It is curious that for both a tremolo and a trill the upper limit seems to be more or less the same: with the metronome on 90 beats per second, it’s somewhere around 8 notes per beat = 720 notes per minute = 12 notes per second (this will vary according to each individual player). This is fast – but woodpeckers are faster, reaching speeds of up to 20 pecks per second! Even though 12 notes per second is fast (for any manual activity), the fact that the tremolo or trill is not particularly difficult, means that it doesn’t feel fast. We can achieve these high speeds relatively easily only because the movements involved in each “change to the next note” are very small and are not complex (difficult). On their own, rapid bow changes on the same string , and most slurred rapid finger changes in the same hand position, require very little movement and can usually be considered relatively “easy” (but with plenty of left hand tongue [finger] twisters as exceptions). 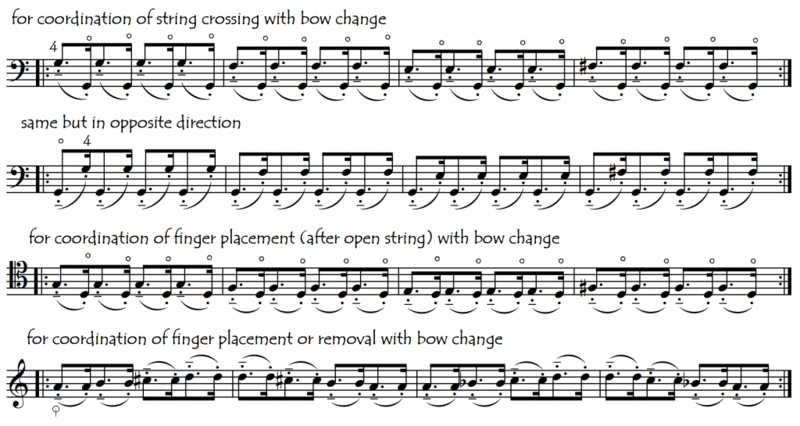 Other changes, requiring greater muscular activity (such as large shifts and string crossings), more unnatural movements (tricky finger combinations) or combining several different movements (such as bow change + string change + finger change + shift) are however much more difficult to do quickly. Speed is thus a totally relative concept, and whether or not a passage can be considered “fast” is not determined by the absolute number of notes played per second nor by the metronome mark, but rather by the amplitude (size) and difficulty (complexity) of the movements involved in relation to the amount of time that we have in which to do them. In many ways “fast” is more a measure of difficulty than of speed, as things that feel “fast” for some players will feel simply comfortable for others! What is “too fast” for some players may even be “boring” and “unchallenging” for others. 2: WHAT THEN IS “FAST PLAYING” ? Do you know the “viola joke” about fast playing: A violist claimed that he could play really fast – even semidemiquavers (32nd notes). His colleagues asked him to show them ……. by playing one ! Fast means “with little time”. When we talk about “fast playing” we are normally referring to passages in which we have a lot of notes to play in a short period of time. But sometimes (very often in fact), even if we have only two notes to play, to get from one note to the next, we have to play one single isolated movement very fast (see examples below). These situations can be considered simply as posing a problem of coordination rather than a problem of “fast playing”. The best examples of this type of isolated fast movements are given by dotted (or even better, double-dotted) rhythms. It is interesting and useful to work on these individual fast movements in an isolated way, studying them separately as though we were working with chemicals in a “laboratory”. This is useful because a “fast passage” is simply a succession of many of these small isolated coordination problems, all following each other in a short time. These movements are the basic building blocks of a fast passage. As mentioned above, when there are just a few of these fast movements together, or if they are particularly difficult movements then we will call it a “tricky” passage rather than a “fast” passage. Be aware that, even though the 32nd note (semidemiquaver) looks fast (because it is so short), the fast movement actually comes after the short note. To prepare for the playing of the short note we in fact have all the time in the world, as we can take time from the long note preceding it. Conversely, even though the note after the semidemiquaver is long, we have very little time to prepare for it. It is this lack of preparation time that makes it “fast”. Fast always refers to the amount of time we have between the notes. This time between the notes is the amount of time we have to prepare the next note and when it is small ….. we have to be fast! We have seen that “fast” is not necessarily difficult. A change from one note to the next can be anywhere on a scale of difficulty from extremely easy (trill, tremolo) to extremely difficult (large shift + large string crossing + other complications). The “easiest” fast passages, repeat over and over again (rapidly), the same simple movement and don’t pose coordination problems between the two hands. For example, tremolo and trills don’t need much practice because there is nothing really to coordinate: in each case it is only one hand that is “spinning”. But when we start to combine fast changes of different elements in the two hands simultaneously, we rapidly enter into difficult territory as now we need to perfectly coordinate (synchronise) these changes. Try for example doing your trill now with a separate bow for each note. Here we are simply combining an easy tremolo with an easy trill, but the sum of these two easy elements gives something indescribably more difficult: a true tongue twister. This difference between “easy fast” (slurred trill) and “tricky fast” (trill with separate bows) is determined by the need for coordination between the two hands. To increase the difficulty even more we could make the string crossing a leap over 2 (or 3) strings and make the shift larger. Very often we can prepare movements before they actually musically (rhythmically) required, and by so doing, we separate movements into a consecutive chain that would otherwise need to be performed simultaneously. This anticipation thus eliminates potentially problematic coordination difficulties. In the following example, absolutely all of the left hand articulations are anticipated (prepared). None of them coincide with the bow change/string crossing. Sometimes however we have no choice and must coordinate the movements simultaneously. This is when things start to get difficult and innate sporting talent (good fast timing and coordination) really helps. In the following example we need to coordinate perfectly the slurred string crossing with a finger articulation (A) or a finger release (R). Even at slow speeds this is not easy! Note that the first finger on the A string doesn’t move at all in the following example – it stays stopped throughout. We have a whole separate page dedicated to this question (click here). Seizing up – getting blocked – in fast passages, is often a sign that we are trying to play individually every little note. How can we fix this? When playing rapidly, we mustn’t try to think about consciously playing each note as a separate entity – there is simply not enough time. We just need to have a few control points situated along the way, while for the rest of the notes, we simply let the hand do its work peacefully and automatically, as shown in the second line of the following example.Fast chromatic scales provide good study material for this subject because, although we are moving rapidly, we are not moving large distances. Therefore, chromatic scales are more of a brain problem than a real physical difficulty. Another example of the difference between overcontrol and healthy control, taken this time from the world of psychology: compare the positive effects of the healthy interest of a parent (or partner) in supporting what their loved ones are doing, with the negative effects of the overbearing, suffocating, “interest” of a parent/spouse who wants to control every detail of their loved one’s life!! And now, coming back to cello technique, another example to illustrate this phenomenon. Try playing a chromatic scale once again, but this time using only one finger. If we try to play this above example “carefully and exactly” (with one movement for each note) it will be an almost impossible exercise in coordination and will drive us quite crazy! However if we do it with a smooth, relaxed, totally loose glissando it’s as easy as pie! And the intonation is no problem if we use a few control points on the way up and down as shown on the second line. Try it on any finger – even on the thumb! The biggest problem with fast and tricky passages is our natural tendency to play them too fast. Either we start too fast from the very beginning, or we accelerate during the passage (or both). This is Rushing, a very unwanted and dangerous – but totally natural – phenomenon to which we have dedicated a page of its own. The combination of fast and soft is a curious (and difficult) one. We generally associate “soft” with the concepts of “gentle”, “tender”, “relaxed”, “sleepy” and even “slow”, so playing fast and soft simultaneously can feel a little contradictory. It’s a little like whispering when very angry, or running a 100m sprint on the tips of your toes: it just doesn’t feel “natural”. The energy, speed and articulation needed for fast playing are more easily applied and controlled when we play louder. Try the following passages, both loudly and softly and you will see this. This contradiction is most pronounced for the Left Hand. The cello is quite a large instrument and it’s strings are not only thick and long but also quite high above the fingerboard. Because of these properties, compared to many other instruments the cello needs quite a strong and energetic articulation of the left hand fingers in order for the notes to speak, even in pianissimo playing. To play softly, we automatically reduce the pressure of the bow on the string. But if we simultaneously reduce the energy level of the left hand in parallel with this reduction in bow pressure, we are likely to lose the clarity of the articulation of each individual note in our fast soft passages. With the exception of Thumb Position (where the thumb is holding the string down to the fingerboard), the cellist’s left hand fingers can’t really just race lightly over the notes. In fact, when playing softly and fast, the Left Hand needs to articulate with almost the same energy and speed as if we were playing loudly. This is especially so in slurred passages, because in a slur, the bow cannot help with the articulation of each new note. Thus we basically have to “uncoordinate” the energy levels of the left and right hands in fast soft playing. This is like those amusing coordination party tricks such as rubbing circles on our tummy while tapping our head, or doing clockwise circles with our right foot while drawing a 6 in the air with our right hand: it doesn’t come naturally ………….. and thus requires practice. Curiously, as with the above examples, it is in orchestral repertoire that we will most often need this skill. Imagine this situation: we know that we will have to leap out of bed and perform some high-speed tasks at 8.00 AM. We have a choice: either we stay deeply asleep till 7.59.59 when the alarm goes off, or we wake ourselves up a little earlier in order to prepare ourselves for the sudden radical change in activity level. This same situation occurs regularly in music: we need to take off suddenly at top speed after a long note (or silence). In the same way that we can decompose any fast passage into its different components, we can classify fast repertoire passages according to the types of difficulty that they contain. In this way we can create a sort of approximate hierarchy of difficulty that might might allow us to work on our fast playing in a more progressive and structured way. Some fast passages are almost exclusively problematic for the left-hand. Others might pose almost exclusively right-hand problems. But the majority involve coordination problems between the two hands. By practicing any fast passage with a variety of bowings: slurred, separate (including spiccato) and mixed we not only integrate the passage better into our brain and hands, we also improve our general fast coordination skills between the two hands. Let’s look at some musical examples. Clicking on the highlighted links opens up compilations of repertoire excerpts for each “category”. .
4:1:1 Pure, Simple, Fast Finger Articulation (Same Position, Same String): The simplest, easiest note change is from one note to another in the same position and on the same string. So let’s start by looking at passages in one position and on one string.